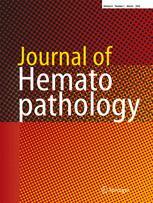 The Journal of Hematopathology provides pathologists interested in hematopathology with all the information needed to perform modern pathology in evaluating lymphoid tissues and bone marrow. The Journal publishes reviews, editorials, comments, original papers, guidelines and protocols, papers on ancillary techniques, and case reports in the fields of the pathology, molecular biology, and clinical features of diseases of the hematopoietic system. The Journal is unique in its international character, helping to address the huge geographical variations in incidence of disease. The Journal offers a sure reference point for all pathologists with an interest in hematopathology. Molecular biologists involved in the expanding field of molecular diagnostics and research on lymphomas and leukemia benefit from the journal, too. Furthermore, the journal is of major interest for hematologists dealing with patients suffering from lymphomas, leukemias, and other diseases.